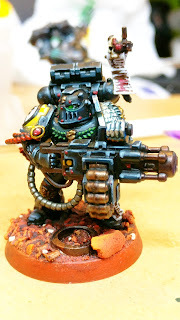 Thanks to my own Hobby Season commitments it's always been very difficult to fit in the various hobby challenges that go on throughout the year but somehow I realised my AoP Sentinels may well fit the bill for Dreadtober and luckily Todd agreed I should give it a go so they will form my entry. I'll be honest, I'm getting a little tired of these. Every night an hour, hour and a half and there still seems so much left to do. As Marcelis says though there's the law of diminishing returns though and I'm of the opinion to just let some of this stuff go. Of course then my OCD kicks in and I feel like I've let myself down by not doing the best I can, but time is running out and if I want any chance of completing the Sentinels for AoP I have to get onto them ASAP. I think at this stage I may well have abandoned the new board, sadly. Anyway I've inadvertantly split Kill Team Cassius in half, completing the black highlights on these and in an effort to move things on may not even bother with tidying up the line highlights with some additional black shading asI'm not sure it adds anything. You can see from Garran Branatar I followed up on my decision with Green lenses. I still need to done down some of the metals, add the flames and pick out a few details and then it's edge the base and varnish. Zameon Gydrael is next and as you can see I've tied it into my Dark Angels by having the weathered brass and bronze. 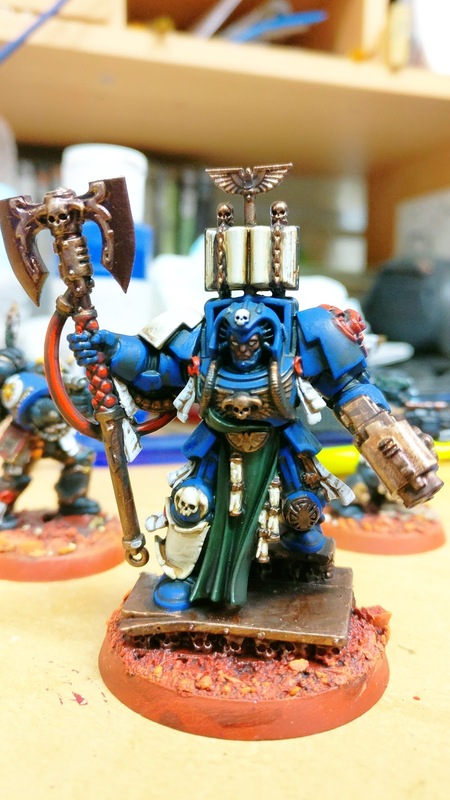 He may well join my Veteran Squad should I ever get round to deciding what weapons they're having. I'll have gone through 3 Codices and an Index without settling on something, maybe just the rule of cool? Anyway, I tried something a little different on Zameon's Power Sword. 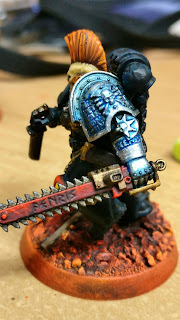 I was looking at Duncan's Simple Power Sword Glow Tutorial, but swapped Guilliman Blue for a thinned Bahama Blue and went OTT with the Nihilakh Oxide. I still wasn't convinced and with so much Verdigris on it anyway needed to do something to make it more 'powered' so brought in the pure white glow. It's still not quite what I was after but it'll do. Zameon just needs his plasma pistol finishing off. Edryc Setorax had a similar effect on his Power Claws, still need to add the white. Just some very minor tweaks and some bits on the pillar he's leaping off/landing on. Perhaps do something with his feathers again weird 'Ravens' that are supposed to be white, yellow and black...?! Vael Donatus, I'm less than impresse with his Pteruges [the kilt strip thing] but I didn;t do a good job on the last one I did [some Assault on Black Reach model?] either. All of these need some further tweaks on their bases and all their purity seals need a Soft Tone sepia wash since the little script has been added [poorly as usual]. 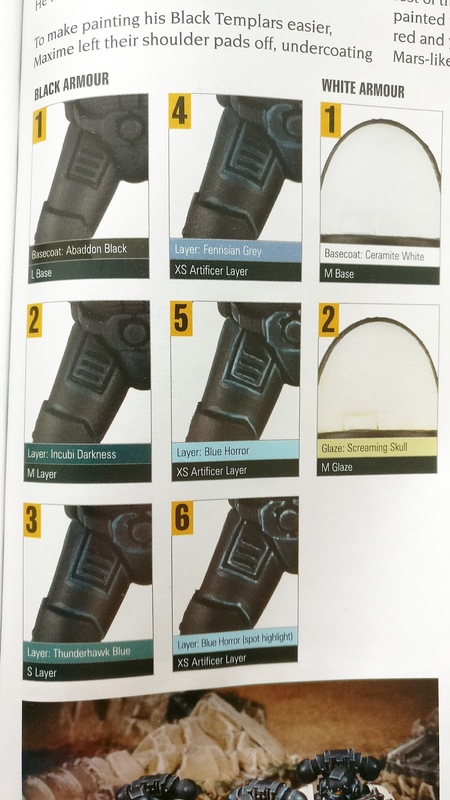 For those wondering about the black highlights, it was this guide recently in White Dwarf that I was looking at. I've not followed it closely but it's a great starting point. And also why I was looking at yellow eyes. and green and ultimately went with the Green. There are currently only 4 with lenses anyway so I really don't need to continue the debate on the subject than the opinions already gratefully received on Facebook, a decision was needed so I could crack on. 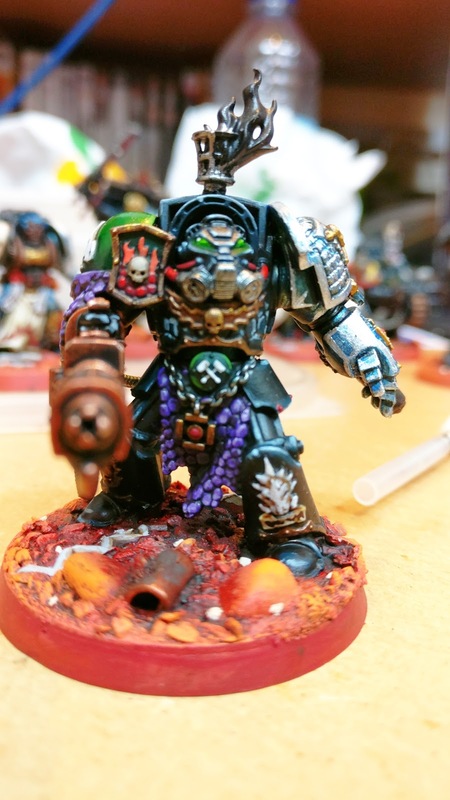 And with time so critical I was quite stern with myself to only focus on the Deathwatch and not spend time on the Dark Angel Terminator Librarian... Of course that thought some became the thing I wanted to focus on the most and inevitably painted his armour blue. 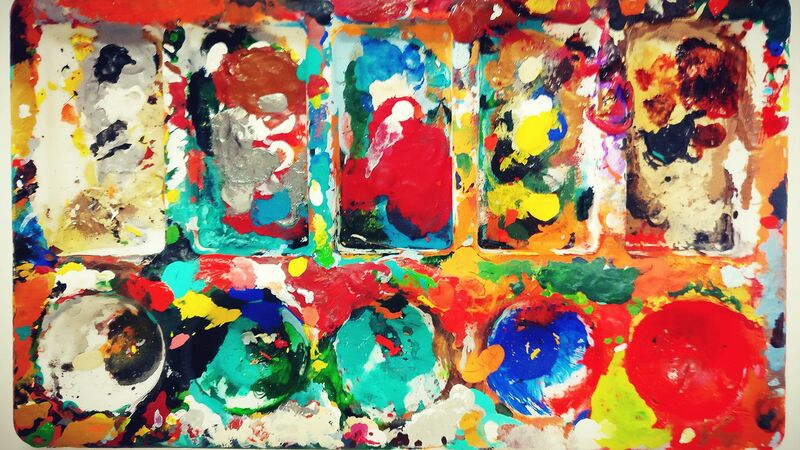 And being incredibly weak willed and impressionable I completed the second highlights. It's like in a recent episeod of Taskmaster where they said that if you think the word 'salivate' you automatically do... [your welcome]. Bless me readers for I have sinned, it's been nearly 3 months since my last confession. For the most part you all knew what was on it anyway. I pushed on through the Genestealer Cult and felt like I was casually getting into the Deathwatch, however that's now become something of an urgent task. My To Do List has down my Armies on Parade board. This is nothing grand, just a new red planet 2'x2' that has an area that has been tiled with large pre-cast concrete slabs. I have some sheets of MDF that have nice pre-painted tiles on. They came from my Great-Aunt's house when it was sold and I thought one would make an interesting base for the tile. 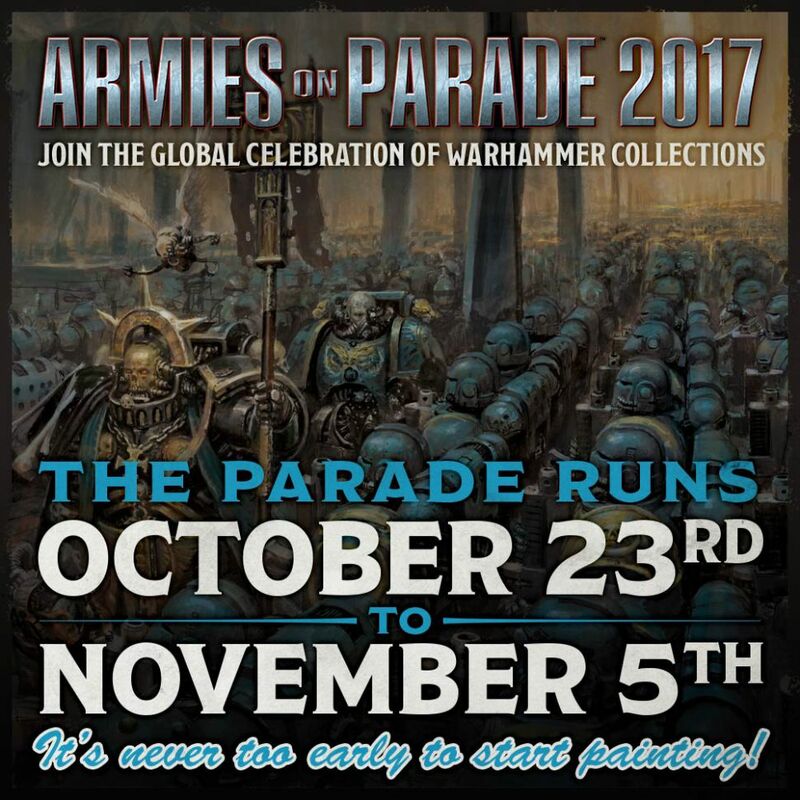 But Armies on Parade begins on the 23rd October, which means it's just 4 weeks away. 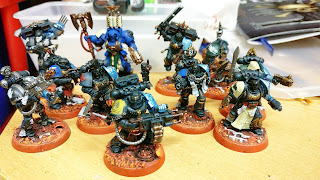 In this time I need the Deathwatch done, which is doable. 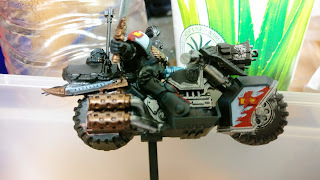 I expect them to be complete in a week or two [although I have my doubts about the White Scar biker Jetek Suberei, but no loss if he doesn't make it]. 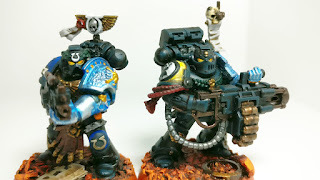 But something that would make the theme of my Cultists attacking the Deathwatch defending a small storage compound so much better - these two. Now getting the board, Deathwatch and Sentinels completed in 4 weeks is nigh impossible, for me that is. I might make two but three is a stretch. 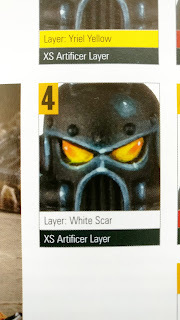 So the priority will be Deathwatch and Sentinels. 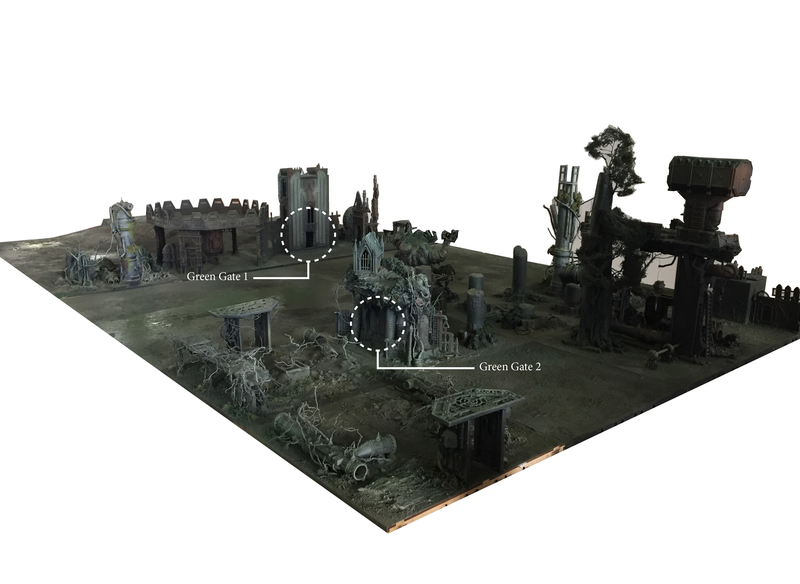 I can try and print a new backdrop, as that won't impact my hobby time at home and potentially one of my existing flat Realm of Battle boards will suffice if there is no time to create a new one. Obviously that will mean I flatly abandoned my To Do List goal, but if the Sentinels get done that will more than make up for it. 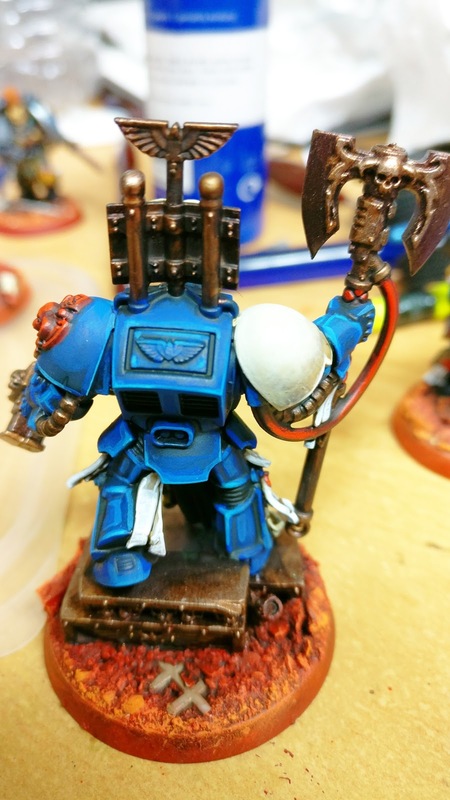 But with just 28 days until AoP time management is key and by the looks of it I have quite the challenge given the speed I paint. Anyway, we'll look again nearer the time. 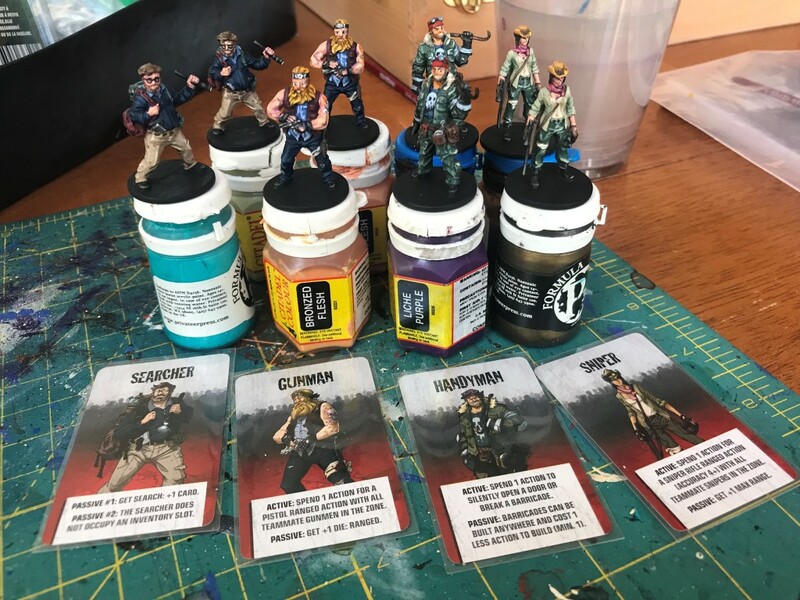 Iapedus at Languor Management recently did an inventory check of all the models he had to paint with the rather drastic result of entering into a 12 step programme to try and curtail his relentless hobby spending. As a self-confessed hobby addict myself I could understand his situation. Thankfully my hobby spending is rather more controlled. I'm sure we're both getting top bargains, which is part of the fun side of scouring ebay but I'm always mindful of what I already have knocking around. That said I have vision in my head of things I want to do and at times that requires a purchase to then turn that fantasy into a reality. 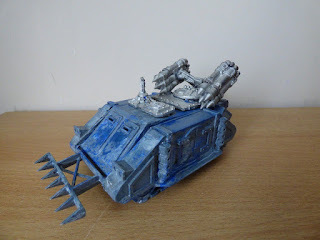 hungering for this model for quite a while, which again is a shame as I like the current Whirlwind to. But, for £9 that's not a bad deal and again I got the adrenal kick of a real auction, sniping in the last minute. I then followed up with another purchase. 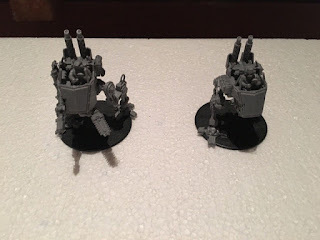 Sentinels for my Genestealer Cult, I love the concept and aesthetic of the these. 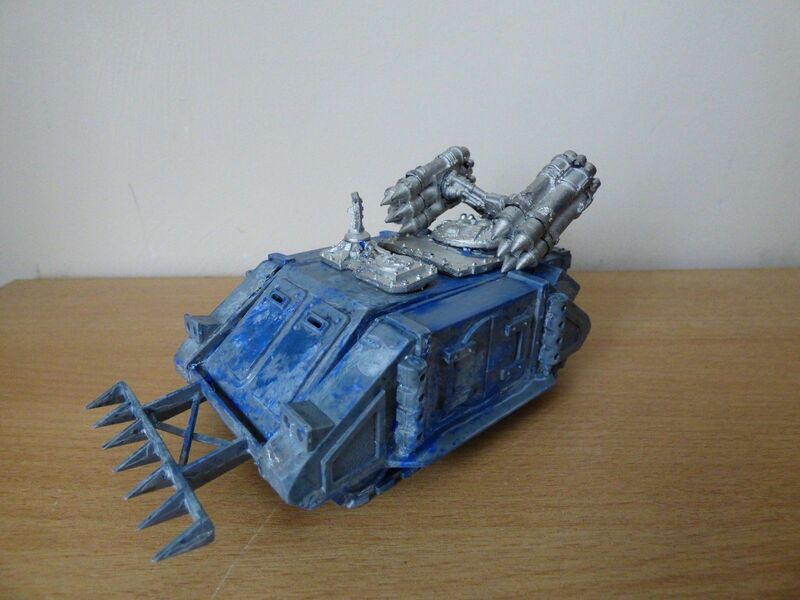 Two with flamers and close combat chainsaws. Sadly missing weapons on one and their canopies but I can live with that. Final auction price £15.10 [plus £2.90 postage]. Again a pretty good bargain at 40% off. The missing weapons are unfortunate but I'll pick them up at some point. However, the purchases have made me think, in much the same way Iapedus tool stock. I have plenty of models now and I will therefore not be getting any more for the foreseeable future. 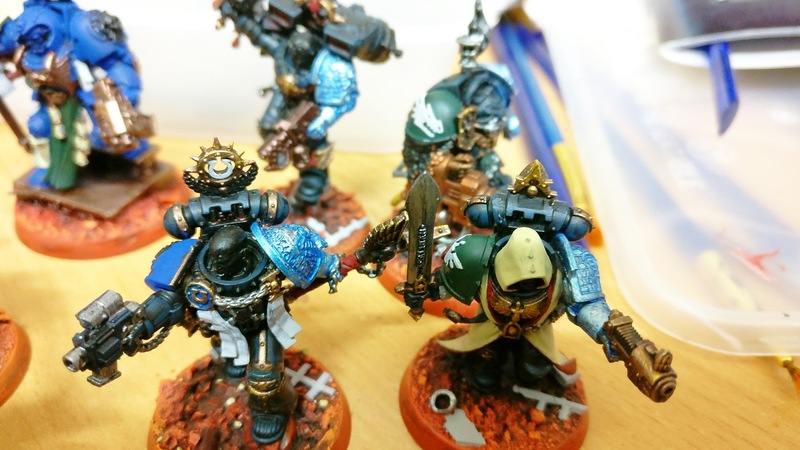 My To Do List has me covered so new models are just going to be sat waiting to paint and I want to keep my spends down too. That said there are a number of exceptions. I have some Amazon Vouchers, which would allow me to pick up some more Acolytes. 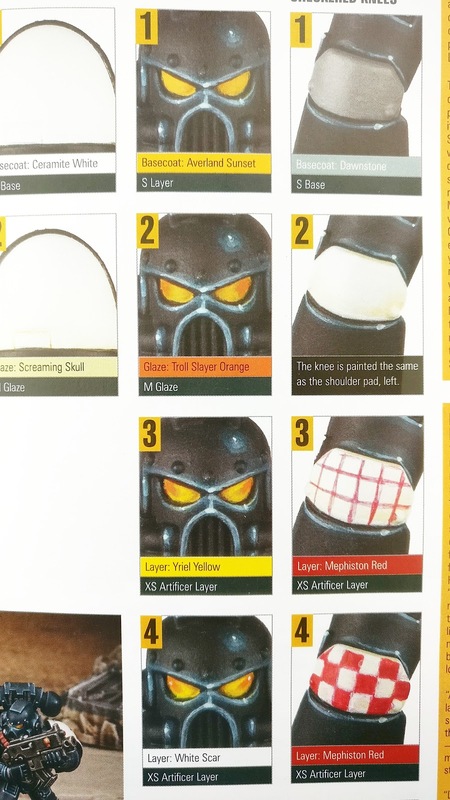 This would give me plenty of options for my second set of Deathwatch Cultists - making them far more intersting and divers compare with the standard set I already have. 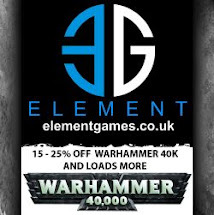 Additionally I have £40 of vouchers for Wargames. 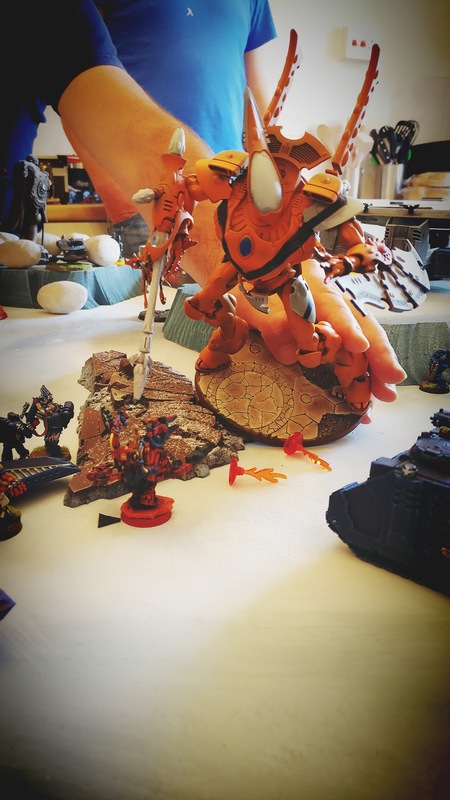 I've earmarked that for the Tyranid Codex, rumoured for October/November. 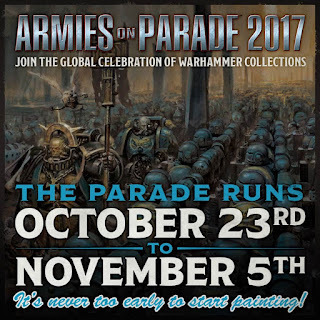 In addition I'll be ordering a box of Empire Flagellants. I've always loved them from back when they were only available in metal. I loved their rules and figures and the plastic ones look fantastic. 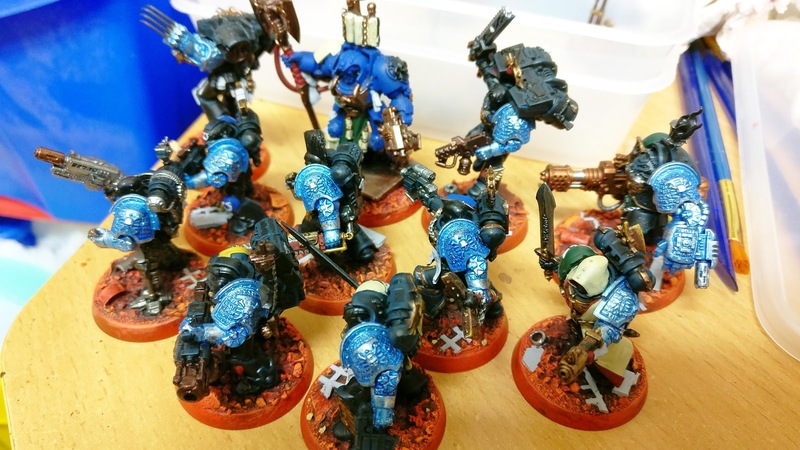 I'm planning to convert them into my Genestealer cult so I have even more random diversity - a heady mix of [chaos] cultists, mine-worker cultists, fanatic cultists and maybe even some Guard Cultists one day - to illustrate how the cult infiltrated all manner of Ferron society. Coincidentally I didn't even know he was called Redblade when I painted his chainsword. I just figured he was cheeky enough to get away with painting it red because it seems to be a Deathwatch compliant colour but he's doing it for his own purposes. 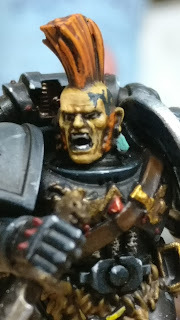 Subsequent addition of eyes, teeth, black highlights and a tattoo on the side of his head. I looked up some nordic/tribal tattoos and my freehand let me down so bad. Granted these macro shots highlight all my imperfections, I swear his eyes look great when viewed normaly but clearly his left one is way wonky when zoomed in. Anyway his tattoo was supposed to be three tribal loops, but it's come across more like a crappy Loch Ness monster. 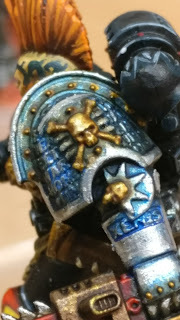 On the one hand this is a big disappointment, on the other I find it hilarious that he ended up with a rubbish tattoo, perhaps after a drunken bet :) I also added some gold detailing to his silver arm, looks like I need to cover up some of the paint that bled off the rivets but really pleased and the extra Dark Tone shading on the blue makes it a little more battleword and cartoony which I like. Some details on the back, yellow string for added showing off by the naughty puppy. I also used some Nihilakh Oxide on his Rune Stones. I;ve no idea what i was trying to convey - glowing stones? Ice? Not quite sure but I really like how this one came out. 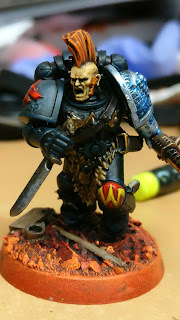 Fundamentally he is now complete, which feels really cool, I just have to finish the other 12 miniatures. 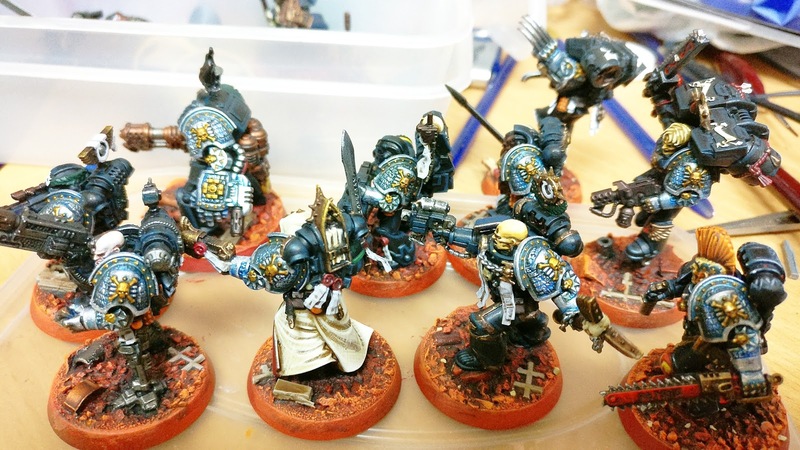 I've done some additional work on a number of models too, mainly basecoats and washes for skintones. Here's Ennox Sorrlock. 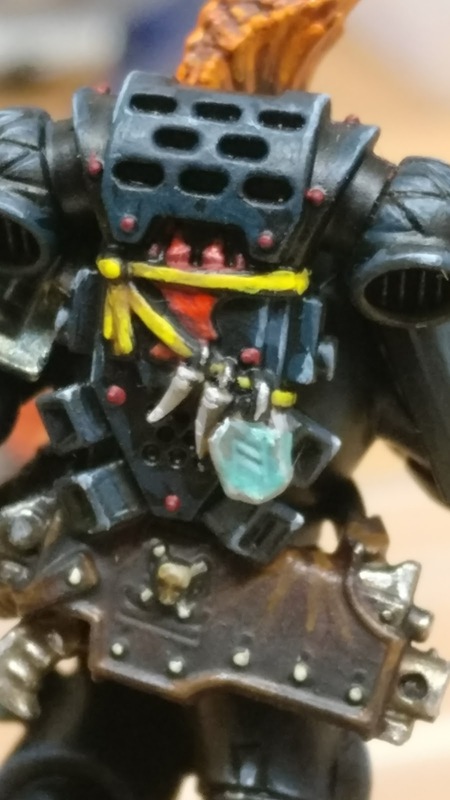 I didn't even bother with two thin coats, just the one as I thought the black undercoat showing through added a bit of texture to his skintone that fit the Iron Hands USP. A subsequent sepia/Bloodletter red glaze mix wash gave me the shading I was after. 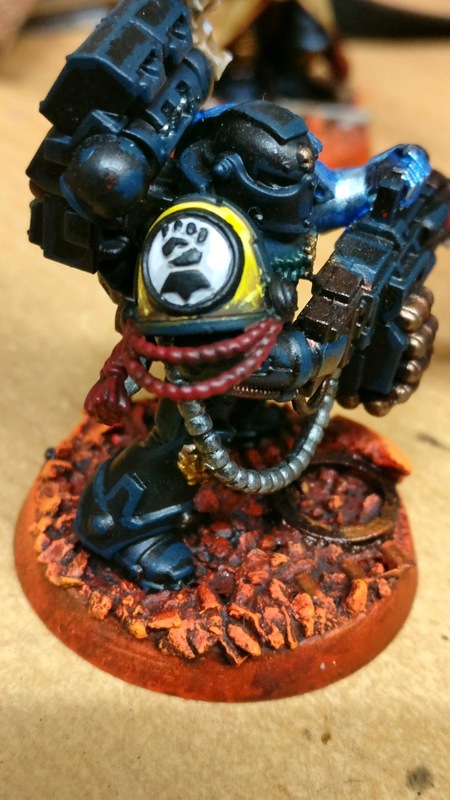 Rupert Grint, er, I mean Rodricus Grytt also got his chapter shoulder pad done. Not as warm as I'd like but that's my own fault with starting with Iyanden Darksun and sepia shading instead of an orange. I'm also a little unconvinced of the slight weathering I added as it's too small a space to comprehend that it's intentional, I'm really not that fussed but it's my OCD being picky. Yo, yo, yo, folks, coming outta left field something [almost] completely off list I have a Space Hulk Broodlord that I've been wanting to get painted for a while but given the variety of base sizes and purpose of the model - 40k/Space Hulk/Deathwatch Overkill I wanted to magnetise the base for versatility. 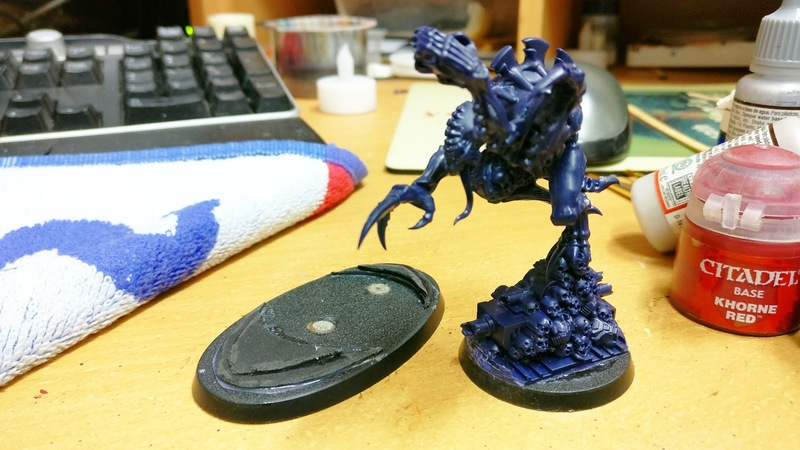 So far I've done my Death Storm Broodlord and Overwatch Patriarch on the bigger oval bases [though I'm not entering into the new base sizes for Carnifex]. 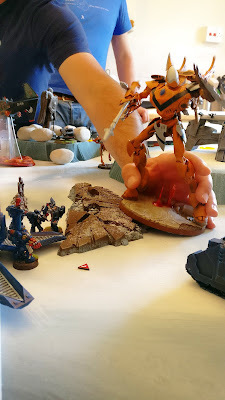 However, the oval doesn't work in Overkill and certainly won't in Space Hulk [should I ever have the urge to play it]. 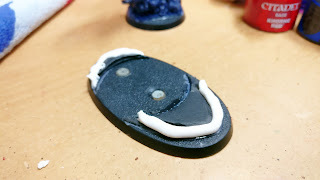 So I decided to mount this one on a 40mm round base with magnets and a separate oval base that it can attach to. I also started to build up the surrounding oval with mounting card so it doesn't look quite so 'stuck on'. I even went to the trouble of filming it, those Magentix magents are just extreme, notice how the sound seems to happen before the magnets snap together - fierce. 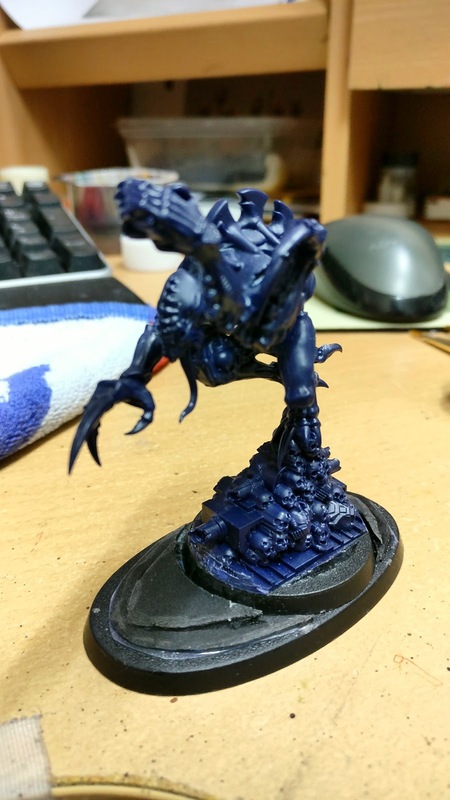 I probably could have gone with smaller magnets on the base [next time]. I then had some filler handy, which a squeeze started to smooth out the transitions on the mounting card. Post application I realised I'd thought this was tile adhesive, which would have been a better choice perhaps, far more durable. However this stuff was really easy to smooth into shape. I've since added some more to the top to make the transition to the round base less pronounced. 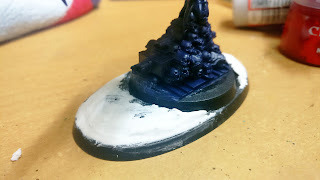 I'll be adding a bit of rubble on top anyway and the remains of the broken pipe from the Broodlord's display base. I should probably even get some of those new skulls to try and continue his base theme but this has been one of those tasks that has long been in thought only and it took just a little effort to move it forward, five minutes here and there before starting my Deathwatch sessions and I'm then looking at getting it based and primed. 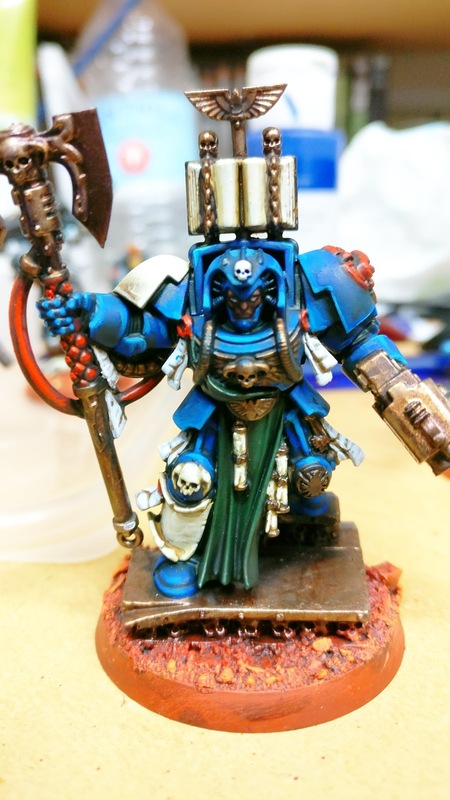 This is definitely a model that can be painted between 'real' tasks just to add something familiar, comfortable and end up with a cool model when it's done. A week or so before the NWO I got a last minute text by Ben to come and have a game. 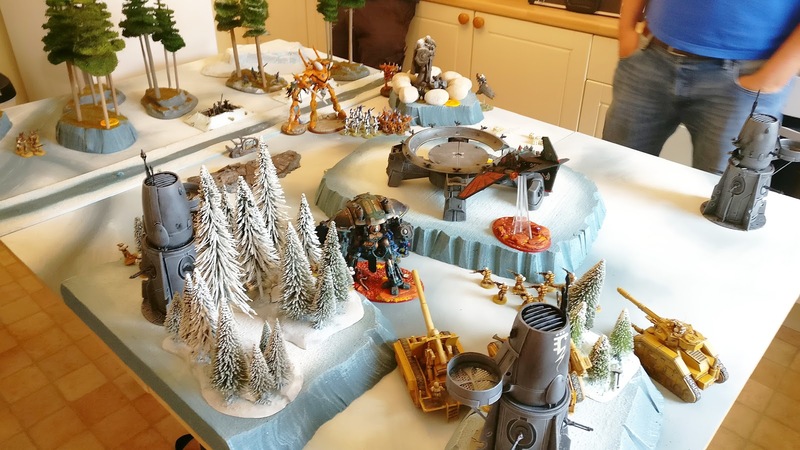 Somehow the planets had aligned and both he and Otty were on leave at the same time and he'd managed to get Scott and Liam to come down as well and was going to set up a game - 8th for everyone! I didn't quite understand what I was supposed to bring but he insisted on my Dark Angels so I rocked up with around 3,500 points and only had 660 allocated to me which I resolved in the form of my Dark Talon, Imperial Knight and a Techmarine. 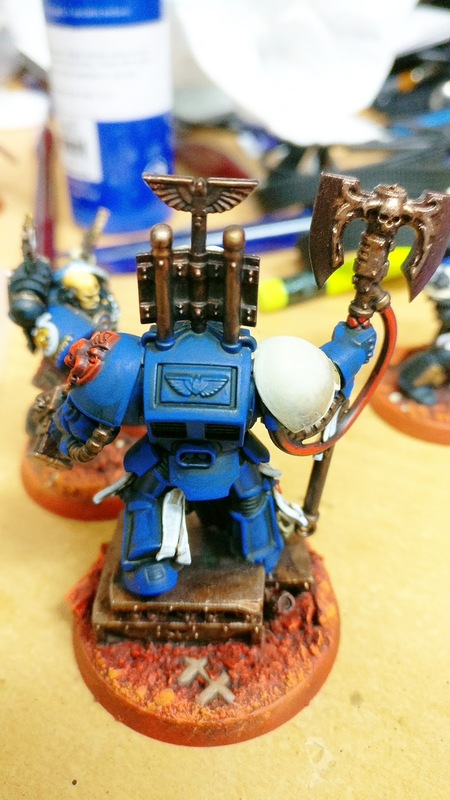 Ben had some of his Guard and Liam brought in some of his Crimson Fists [I think with Pedro]. 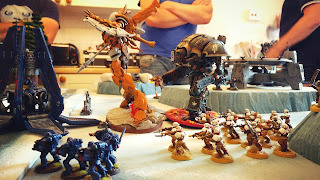 On the other side Otty and Scott had some Aeldari - the Wraith Knight and Avatar being of particular concern. 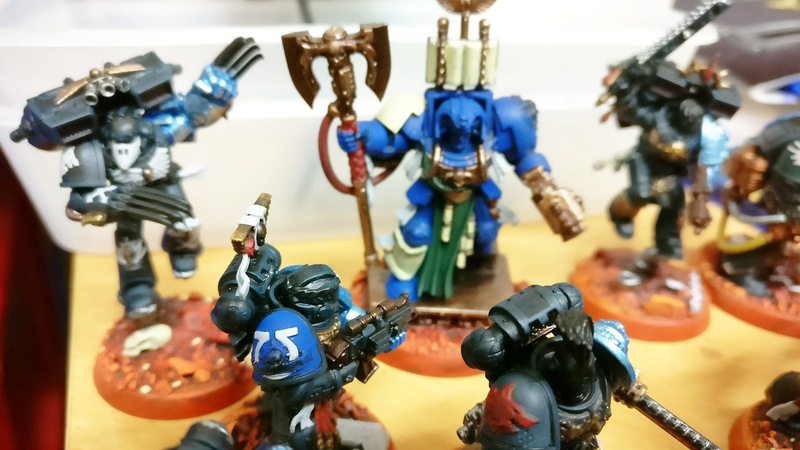 I never intended for this to be a battle report so didn;t take too many pictures but did want to record some of my feelings as the influenced my feelings of 8th going into the NWO. A lot of this has been adressed in the comments from the NWO reports but at the time I'd gone into the game with my own [limited] experiences and initial tournament feedback reporting those who went first had a 75% chance of winning the game. With my loathing of the Alpha Strike [both on the giving and receiving end] it was a mixed blessing that we stole the initiative on the reroll. 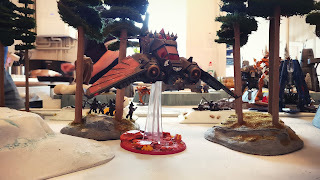 This allowed my Dark Talon to fly forward and drop it's Stasis Bomb on the Dire Avengers - Mortal Wounds on a 4+... I think 7 died and then Morale killed the rest. I felt pretty crappy about it, usually I play for First Blood, trying to get a unit killed with the likes of Ork Trukks, Rhino's etc. 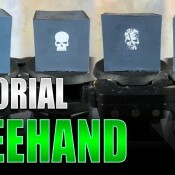 as an easy kill that doesn't make your opponent feel like they've lost the core of their army. 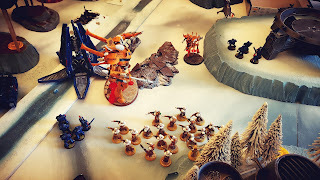 Dire Avengers weren;t too big a loss but it still felt mean. The Dark Talon continued to zoom around wreaking havoc. 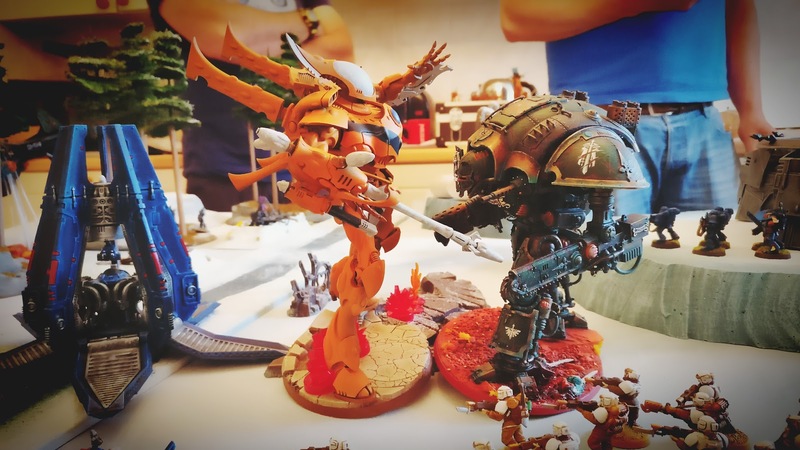 slaying the Imperial Knight before I got to kill it off. 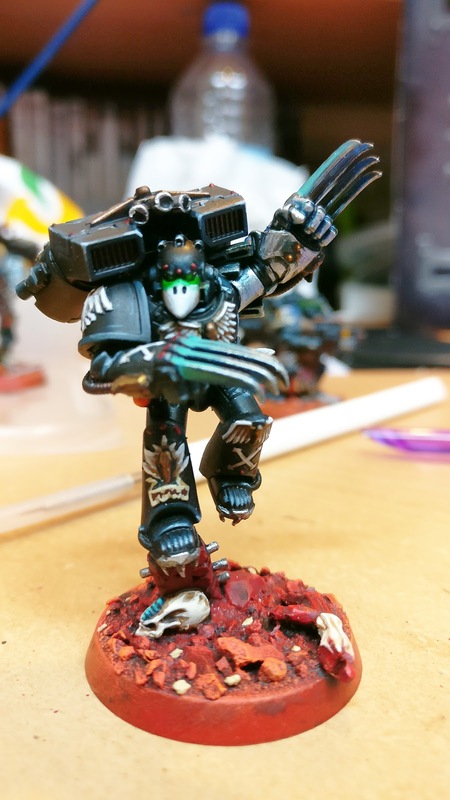 I guess Liam was right about using the Chainsword afterall. I can't remember who won in the end, but the Knight battle symptomatic of my issues leading into NWO in that despite trying to hedge my bets by splitting the attacks I was in fact just being less ruthless. 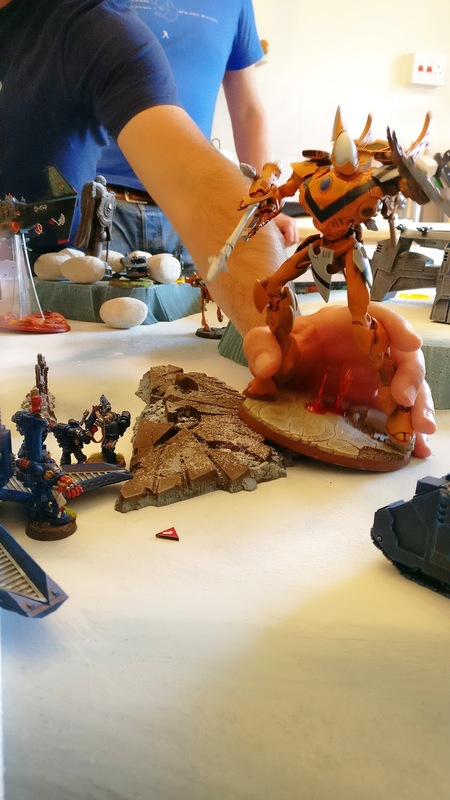 Following the Dark Talon wiping out the Dire Avengeys I spent the remaining game feeling a little dejected. 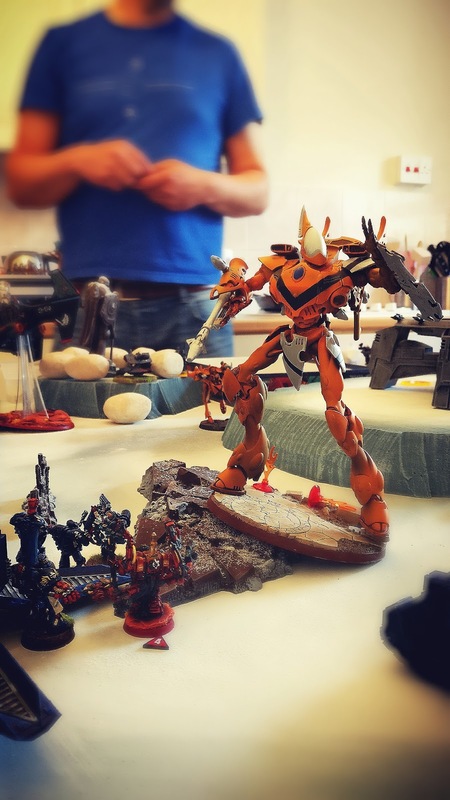 I know the point of the game is to take out units but Eternal War missions are only 1/6 about killing your opponent, the rest are objectives and being able to win a game by playing the objectives has always been my favourite way to play. I know some see the best way to secure those objectives by removing your opponents army to make things easier but most times you would both be playing the same way. At this point 8th just felt like you HAVE to take advantage of that Alpha Strike and cripple your opponent otherwise you can be damn sure they'll make you pay for not making the killing blow when you had the chance. I've carried some momentum from last season into this season so far, although I wonder in future if I should have some specific down time between seasons? 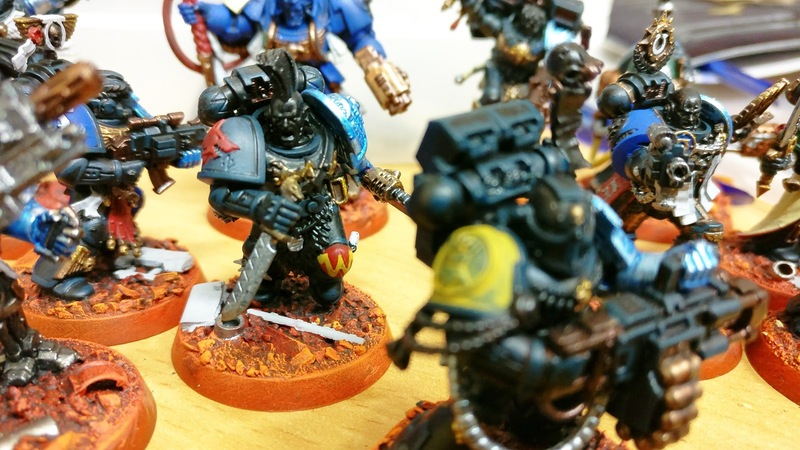 The momentum has been rather sedate and measured, no pressure, just highlighted all the black on the Deathwatch with Incubi Darkness [my new favourite Citadel paint, seriously you should have that in your collection if you want to paint black]. I was getting through the highlights three marines a session [1-1.5hours] which feels slow but it was deliberate and planned that way so at n opoint did it feel tedious. Once I'd done the first highlight I realised I needed to block in all those other colours - chapters, purity seals, bone elements, leather pouches etc. The amount of times I'd then find a purity seal that was missing it's wax was infuriating. But the process revealed I need to batch all the consistent elements - black and metals etc and then having blocked in all the individual colours can apply shades then complete the black as a batch and then I will do something unique for me and paint each model individually with it's chapter elements through to finishing the bases and varnish, which I'll batch again. It's going to be quite the challenge, I've found a few other distractions recently that has slowed progress but I'll get my head straight and focus more soon. The original plan was to find a way to speed paint these but I've only ever done that with my Hobbit Goblins so I'll just stick to what I normally do. 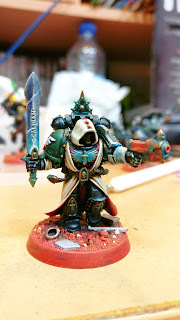 I also threw in the Deathwing Librarian into the mix [hiding in the back] just because everything else is varied it doesn't seem like a huge stretch to include him as well and conveniently that's 2 items from my To Do List! 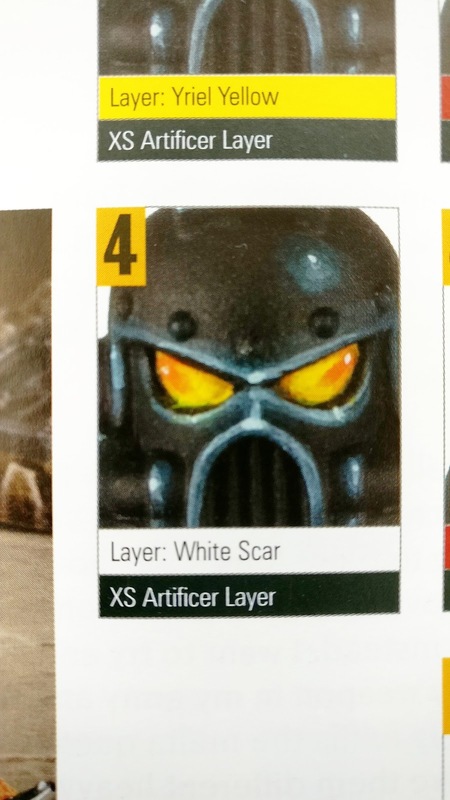 I've not ignored the White Scar biker either. I have to say it's the least appealing element of the whole task but I'm pushing through the task. 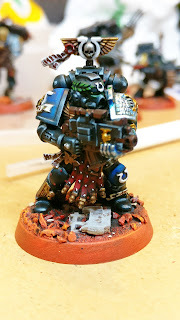 Just a side view of their silver Deathwatch arms. 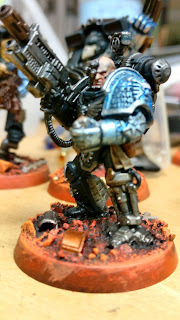 I did the original test back in March, silver with a Bahama blue wash. I'm going to do a little drybrush or pick out some highlights so it's less blue in places. I may even add some black wash in the darkest recesses as well, just for definition. 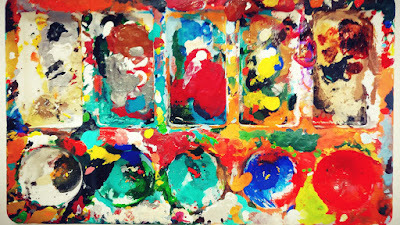 So, good progress and something new to look at on the blog.